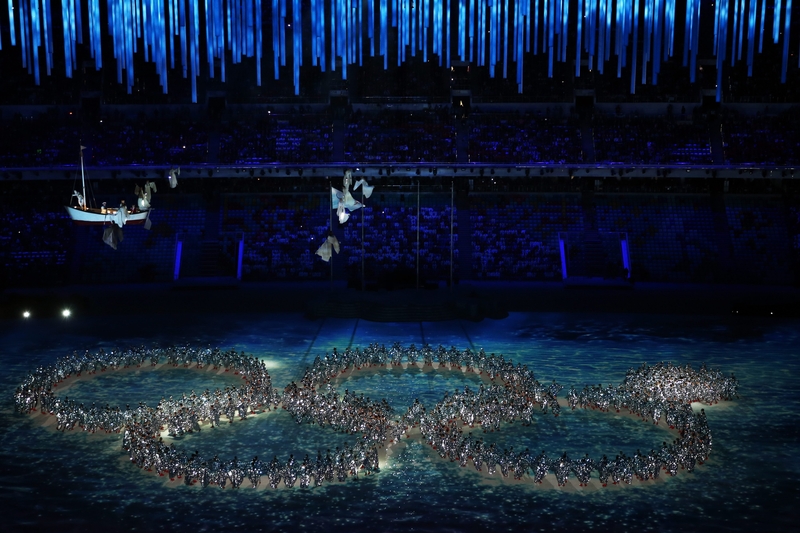 In a charming touch, dancers reenact the Opening Ceremony ring failure during the 2014 Sochi Winter Olympics Closing Ceremony at Fisht Olympic Stadium on Sunday in Sochi, Russia. The host country won the most medals – 33 – during the games. SOCHI, Russia – Russia had so much to prove at the Winter Games. Was spending however-many billions of dollars to build an Olympics-industrial complex from scratch on the edge of the Black Sea worth it? How could the country overcome a thicket of potential problems: security worries, logistical obstacles, weather annoyances and the darkening specter of revolution in nearby Ukraine? The closing ceremony Sunday night was advertised as a celebration of Russian culture and heritage: a grand party to show off the work of distinguished Russian musicians, dancers, artists and authors through the centuries. But it seemed as much a great sigh of happy relief as anything else. Russia had done it. It had held an Olympics that was safe and secure and that, thrillingly to the home fans, demonstrated the restoration of Russia’s athletic might. Four years after finishing the Vancouver Games with less than half as many medals as the United States, Russia won the most: 33. Almost overnight, it seemed, the mood in Russia shifted, from a kind of grumbling fatalism to a burst of national pride. In keeping with that, the ceremony Sunday was often loud, sometimes elegant, sometimes flashy, sometimes bewildering. It opened with an excerpt from composer Modest Mussorgsky’s lovely “Pictures at an Exhibition”; featured a children’s choir whose members were drawn from all over Russia; starred a giddy crowd of post-competition Olympic athletes from various countries, rushing in all at once; and hustled people on- and offstage so rapidly that it was sometimes hard to catch why they had been there at all. There were references to painters Wassily Kandinsky and to Marc Chagall. There was music by Sergei Rachmaninoff, Arthur Rubinstein and Vladimir Horowitz. There were ballet dancers. Huge banners depicting some of Russia’s greatest authors – Leo Tolstoy, Nikolai Gogol, Fyodor Dostoyevsky, the dissident writer Aleksandr Solzhenitsyn – were displayed as people ran around waving books in the air. In a charming touch, witty fun was also made of the fact that one of the Olympic rings had malfunctioned during the opening ceremony, leaving an incomplete Olympic insignia of just four rings. This time the Olympic ring pattern was made by performers fanning out across the arena: They opened into the first four rings, waited several minutes and then finally formed the fifth, which was in itself a relief. There is no doubt that Russia felt it had won a kind of cosmic gold medal during these games, not least because they seemed to vindicate the grand ambitions of Russian President Vladimir Putin, whose dream of holding an Olympics here sometimes seemed based more on his own grandiose self-confidence than on reality. But it worked. After all the fears of terrorist attacks, none materialized. The signs had seemed grim: Some three dozen people were killed and scores more injured in Volgograd in three attacks in the months leading to the Olympics. Some fans were scared away. From the United States, the relatives of some athletes said they planned to stay home rather than risk traveling here. There were worries, too, about how well all this new infrastructure would hold up when tens of thousands of people descended en masse, staying, eating and traveling in places where no one had ever set foot before. Some corners of the Olympic development, especially in Krasnaya Polyana, simply were not ready on time. After a number of well-publicized hiccups – unfinished hotels, knobs falling off doors, brown water spewing from faucets, elevators malfunctioning mid-ride – everything began to calm down. By the end, things even seemed not just to be working, but to be working well. In sports, too, Russia prevailed, after a rough start during which, among other things, it faced the horrifying prospect of failing to win as many medals as Norway. In perhaps the most emotionally significant contest of the games, the Russian men’s ice hockey team lost to the United States, 3-2, in a shootout. The defeat sent Russia into collective gloom, the Russian coach into a vortex of self-flagellation and despair, and the Americans into the semifinals, where they promptly lost to Canada. But as if to make up for its setback, Russia then proceeded to win another big-ticket sport, women’s figure skating. In a result that shocked many except, it seemed, the adoring Russian crowd and the skating judges (one of whom is married to the general director of the Russian figure skating federation), Adelina Sotnikova defeated the defending gold medalist, Yuna Kim of South Korea. In the end, Russia took home the most medals, 33, followed by the United States, with 28. Russia also won the most gold medals, 13, followed by Norway, with 11. As the weather grew troubling for various reasons – first it was too hot, and the snow turned to slush; then fog rolled in, and events had to be postponed; then it seemed rain would wash everything away – athletes complained about poor conditions, and in some skiing events, competitor after competitor wiped out while going down the slopes. Some of the most dramatic moments at the games happened in biathlon, the sport that stirs Russians’ passions perhaps more than any other but hockey. The Russian team was emblematic of the country’s Olympic efforts. Mikhail D. Prokhorov, an oligarch, took over the troubled national biathlon federation in 2008 and poured millions of his own rubles into making it gold-worthy. Just before the Sochi Games, a top Russian biathlete tested positive for a banned substance. Then, in Saturday’s men’s relay, the last event of the biathlon competition, Emil Hegle Svendsen of Norway fell apart during his final turn at shooting, ruining the chances of another medal for himself, his country and his celebrated teammate Ole Einar Bjorndalen, the éminence grise of the Norwegian team. In front of a thrilled crowd and volunteers so happy they broke into tears, Russia unexpectedly slipped ahead and, in a thrilling finish, won the relay.